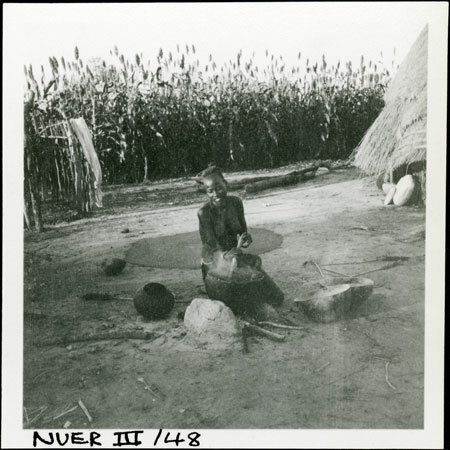 A woman sits next to a large clay pot resting on a fire with buor windscreen, stirring the contents (probably millet or maize porridge) with a stirrer. Beside her are large gourd vessels containing the flour for the porridge which she is adding. Tall millet stems growing in a garden surround the courtyard and hut to the right. Evans-Pritchard spent some 4 weeks in 1935 among the Gaajok tribe living at Mancom village at the mouth of the Nyanding River, the home village of his servant Tiop. Note on print reverse ms pencil - "04 2" & print front border ms ink - "NUER III/48"
Morton, Chris. "A Nuer woman cooking" Southern Sudan Project (in development). 03 Jan. 2006. Pitt Rivers Museum. <http://southernsudan.prm.ox.ac.uk/details/1998.355.123.2/>.